As tablets become more and more powerful, people are looking to them to do more than just be a casual browser or ereader whilst they sit in front of the TV on an evening. Tablets are becoming more popular in general, and we as consumers are beginning to use these light and portable devices in more productive ways than we have historically. We also look to things like stylus to enable us to be more creative on our tablets. Capacitive stylus are much more effective than the old style resistive stylus of yesteryear, especially when used in conjunction with the latest apps running on our dual and quad core tablets! The Ten1 Pogo Sketch Pro mobile phone stylus both looks and feels expensive. The classy design reminds you more of a paintbrush than anything else. Ten1 were obviously going for the artistic demographic, the name, the style, even the message on the back of the case proclaiming that â€œArtists love the Pogo Sketch Proâ€ are all directed to the type of person who would likely use this to draw, rather than write on their device. The stylus itself is thickest towards the bottom, and thins out towards the end. It feels really natural in the hand and is perfectly balanced as well. 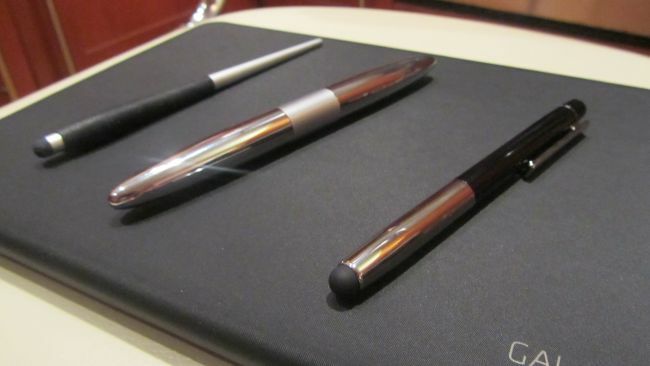 Silver aluminium is the material of choice for this stylus, however the bottom half is completely covered with rubber. This is an interesting design choice which some may or may not like, thereâ€™s no doubt it adds to the great ergonomic feel though. The pen comes together with an additional rough tip which Ten1 call their â€œstandardâ€ tip, the device comes with the â€œproâ€ tip already attached. You also get a handy soft carry case too. The pro tip is excellent, the only reason youâ€™d go for the standard tip is if you happened to lose the pro one. The tips can be swapped by unscrewing, ensuring that there is no chance whatsoever of them falling off themselves. The pro tip is the smallest out of all three on test. It is also made of a lighter material than the others as well. Both of these factors helped make a really enjoyable experience when using the stylus. It really does feel as premium as it looks. The tracking is superb, very accurate and smooth, overall a real joy to use. You can purchase the Ten1 Pogo Sketch Pro stylus from Amazon for Â£19.99Â or MobileFun for Â£23.95. The Hard Candy stylus is the polar opposite of the Pogo Sketch Pro. Where the Pogo stylus was aimed at artists. the Hard Candy stylus is most definitely aimed at writers. The stylus is large, heavy and kind of bulky, but this design was a choice, not an accident. This will definitely appeal to those of you who like to know youâ€™ve got something in your hand. As mentioned, the stylus is aimed at those who want to write, and Hard Candy clarified this even more by including a ballpoint pen in this stylus too. The middle of the stylus holds the Hard Candy branding, and is also the place where both lids are connected. One reveals the stylus, one the pen. I found it quite troublesome actually removing the lid I wanted. They are attached quite tightly and you may find yourself pulling off the lid you didnâ€™t want. There also isn't any indication which end is which, you just have to try your luck! Another slight issue I had is the casing is rather harsh. The metal edges, especially around the lids and where you hold the pen naturally are quite sharp. Not sharp as in youâ€™ll get cut, but just enough to make finding a comfortable holding position hard. Replacing the pen ink cartridge is as easy as with any other standard pen. The tip on the Hard Candy stylus is... well hard. Its made of a thicker and less durable material than the Samsung and Pogo stylus leading to less accurate tracking when used on the tablet. You can purchase the Hard Candy stylusÂ from Amazon for Â£29.95Â or MobileFun for Â£29.95. This official stylus from Samsung doesnâ€™t really jump out as you as anything special. It looks like youâ€™d expect a stylus to look, sort of like a pen. Itâ€™s the only one of the three stylus on test that has a pocket clip, something I was happy to see as it gives you somewhere to hold the stylus whilst not in use. 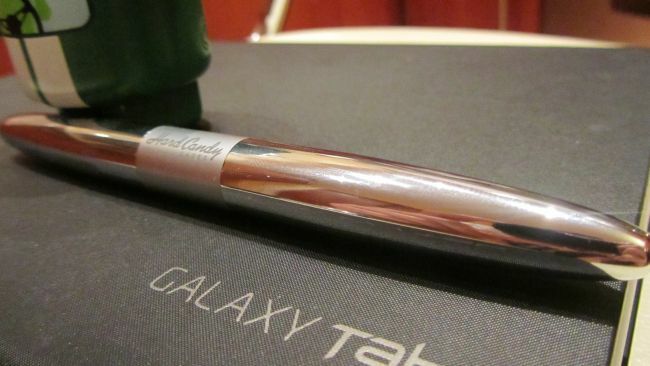 The stylus is black and silver with the Samsung name on the side. AS mentioned, nothing about the design jumps out at you, unlike the Pogo stylus for example, however that's not necessarily a bad thing. Itâ€™s functional design and build will be looked at as a positive for some people, especially those who may use this in the workplace. The stylus is a bit on the small side, the smallest of all on test at least. This shouldnâ€™t pose too much of a problem to people as I have fairly large hands and found the stylus comfortable in use. The weighting of the device is slightly top-heavy (may be down to the pocket clip), you donâ€™t notice this much, however as I was switching between this and the Pogo stylus during the test the difference was noticeable. The tip on the official Samsung product is somewhere in between the Pogo and Hard Stylus. It's of a medium density and is more flexible than the Hard Candy stylus. The tracking is quite accurate, however the top-heavy weighting does make it slightly less comfortable than it could be. You can purchase the Official Samsung Galaxy Tab stylus from Amazon for Â£10.24Â or MobileFun for Â£14.99. My favourite of all three stylus on test. The premium feel and excellent performance won me over. Itâ€™s not the toughest build out there so if youâ€™re heavy handed this is something to take note of. A winner in my books! I didnâ€™t really enjoy using this stylus, its thick and heavy, and the performance leaves something to be desired... However, the strong build and unique design, along with the additional pen included may tempt some of you out there, but not me. I didnâ€™t mind using the Samsung stylus, the pocket clip is also a very welcome addition. It didnâ€™t quite meet the performance of the Pogo stylus, but the design is very suited to office use. In fact, Iâ€™d almost (but not quite!) give up the slight performance benefit of the Pogo to use the Samsung one in meetings at work. Big thanks to the guys over at MobileFun (they sell lots of cool phone accessories) who kindly provided the three stylus on test today.